I'm always so grateful to be part of a church which has a history and a reputation for being incredible givers when it comes to money. A few weeks ago whilst doing the offering I mentioned a couple called Colin and Carole Howells who we met via Dinah Savage who has been part of the Kerith family for a number of years. 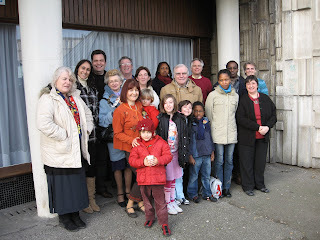 Colin and Carole are part of a small church in Boulogne and wanted to know if we could help them buy a shop in the centre of Boulogne which they wanted to convert to a meeting place for their church and the local community. Ken and Ann Bothamley went out there to meet with them and then subsequently Colin and Carole came to visit us on a Sunday morning. The bottom line is that we decided as leadership to give them £1,000 towards the cost of their building. I have to admit that I didn't think much more about it until I got a great email from Carole to say that they had now completed the purchase and conversion of the shop and had their first meeting there on Easter Sunday. We often give away much larger chunks of money (for instance we just gave £10,000 and did a short term loan for £35,000 to PJ Smyth in Johannesburg to allow him to buy a piece of land for their proposed church building) but it's great to also be involved in some of these 'smaller' projects and see how we can seed things like this and bless people who most of us will never meet. The photos are of the majority of the congregation in Bolulogne stood outside the shop and then a view of the renovation work going on.